FeedbackPanda already speeds up writing feedback. With our browser extension, it will be even faster. This browser add-on takes care of extracting important student and course information from your online ESL classrooms. It then forwards this information to FeedbackPanda. There it can be used to quickly set up new students or courses. As it uses student and course IDs, it will automatically pull up students and courses you have taught before. Chrome users have it the easiest: our extension is listed as FeedbackPanda on the Google Chrome Store. It can be installed right from FeedbackPanda on the Google Chrome Store. Mozilla has been very unreliable in distributing our extension through the Mozilla Add-On Store. This is why we supply both the store-based and a manual installation option here. 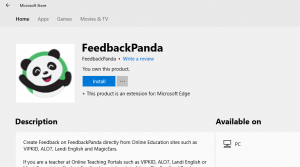 Please go to FeedbackPanda on the Mozilla Add-on Store and follow the installation instructions there. 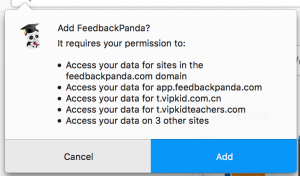 If you are a teacher at Online Teaching Portals such as VIPKID, ALO7, Landi English or MagicEars, giving Student Feedback can take a lot of time. 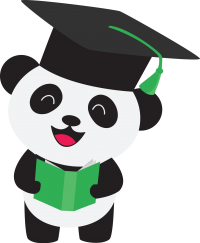 The FeedbackPanda application helps teachers by allowing them to use customizable templates for their Course Feedback, leaving them time to connect more deeply with their student. Please only use this method if the above installation fails or the extension is not available in the Add-on Store. Download the Firefox browser extension file from here: Download File. (Please right-click this link and choose “Save link as”, since Firefox blocks direct addon downloads as a safety feature). Sometimes, this will already present you with this dialog: In this case, clicking the “Add” button will install the extension. If this message is not shown, just save the file to your Downloads folder and continue with the next step. Drag the file you downloaded earlier onto the Add-Ons page using your mouse or trackpad. A confirmation dialog will appear, asking you to add the extension. Click “Add” and the extension will be installed for you. If Firefox reports the addon to be corrupted, please make sure you use no anti-virus software that inspects (and repackages) the addon file after the download. Also please make sure your Firefox is up to date, as older version will also cause corruption messages to appear. 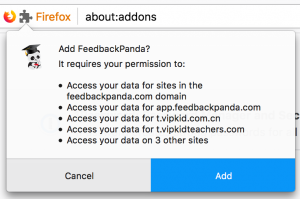 If the installation is blocked by Firefox, please check out this Step-by-Step guide released by Mozilla showing how to allow www.feedbackpanda.com to install add-ons in your Firefox: https://support.mozilla.org/en-US/kb/unable-install-add-ons-extensions-or-themes#w_firefox-prevented-the-site-from-asking-you-to-install-software. Hopefully, that removes the block. There were a couple of people who could still not install it. You might be able to manually install it. The article we linked you also has a “manual installation” hint, at https://support.mozilla.org/en-US/kb/unable-install-add-ons-extensions-or-themes#w_you-are-asked-to-download-the-add-on-rather-than-installing-it. If all of these steps fail, we (still) recommend using Google Chrome and installing the Add-On in a single step. Click the blue “Install” button and confirm any permission question if necessary. The extension will start downloading and installing. Once downloaded and installed, click the blue “Launch” button which will open the Edge browser. Here, you will be presented with a “You have a new extension” dialog in the top right corner. Click “turn it on” to activate the FeedbackPanda browser extension. After activating the extension, the familiar panda logo will appear in your address bar. 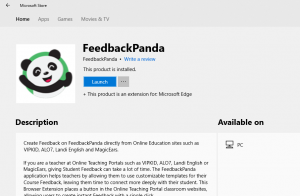 From now on, any supported classroom or feedback page will have the FeedbackPanda button present. All done! The browser extension will only ever run on online ESL websites. It will not run an any non-teaching-related website you visit. The browser extension will only ever integrate into the classrooms of the online ESL websites. It will not interfere with any other parts of the teaching experience. The browser extension will only ever integrate through adding a standalone button with the FeedbackPanda logo. Only when this button is pressed, will the extension search for Student and Course IDs and adjacent information. That information will then be sent to a new tab, opening the FeedbackPanda dashboard. 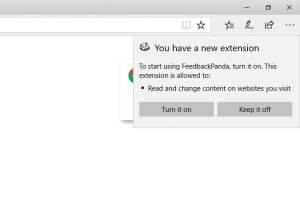 On the FeedbackPanda website, the browser extension will add information to the application that allows our system to assist in browser-extension-related support. No information other than the extension’s presence and version will be communicated. If you want to inspect the source code of the browser extension Chrome, you can easily do that by unpacking the installed browser extension file (Instructions for Chrome / Firefox). If you want a deeper dive into the source code, please contact us at compliance@feedbackpanda.com.